they look like the real thing, don’t they? There is so much good food to discover and enjoy. A lifetime is not enough to fulfill this scope. Even though I have food intolerance, I love to make food for others. I make all sorts of foods, even those I can’t eat and I do it with joy. In fact – probably more than others – people with intolerances know that having good, fresh, healthy food is a privilege, something to treasure and respect every day. When I first wrote this article, over 3 years ago, I had lots of digestive issues but I did not know I was wheat intolerant. I made these for someone who wanted to attend to one of my cooking classes and watch others making ravioli without being able to eat them. “No my dear – I said – you also must eat”. Years later and after a lot of pondering, mistakes and experiments, I have come to accept that I’m among the many that can’t eat wheat anymore. It’s OK really, there’s lots of wonderful food to be had. Now that I start to know a new way of cooking – gluten-free cooking – I can have as much pasta as I want, just like before. And make it for others. None can stop me, not even the gluten. For the filling, blanch spinach or other leaf vegetables in boiling water for 3 min. Drain. Cool under cold water and squeeze very dry. Chop greens finely and transfer to a bowl. Mix in ricotta and grated cheese. For the dough, you can also use a commercial GF flour. Note that each flour mix absorbs a different amount of liquid, so adjust accordingly. If you use a commercial GF flour mix, omit the xanthan and psyllium as most likely there is already a binding agent in the mix. You can make gluten-free pasta using approximately the same method of fresh regular pasta (please see pictures here and a video here). The main difference is that the dough is soft, tears easily and dries very fast so you need to speed up the whole process. Not only do you need to roll the dough quickly, you must keep the sheets a little thicker than those made with regular wheat dough. If the pasta sheet is too thin it will tear. When the sheets are ready, make the ravioli as soon as possible. If they dry you will not be able to fold and to seal them. In a food processor blend the flour, oil and egg until the mixture just begins to form a ball. Depending on the size of the egg, it might be necessary to add a little hot water in order to obtain a soft but not sticky dough. Transfer the dough onto a worktop but keep it covered under a plastic bowl. Set the rollers of a pasta machine on the widest setting. Cut a golf-ball size piece of dough and flatten it quickly into a square with a rolling pin. Feed it through the rollers. 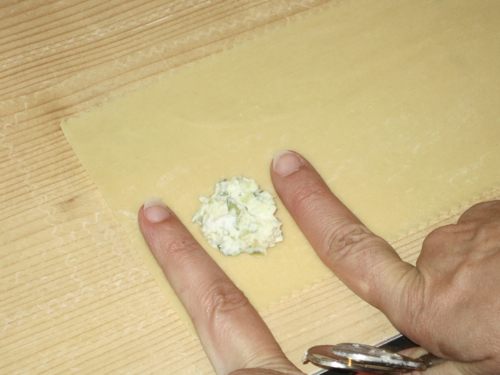 Fold the square in half and feed it through the rollers again to give it a regular shape. Each time you fold it, dust with rice flour to prevent sticking. Don’t overwork it or it will start breaking apart. Turn dial down to an intermediate (narrower) setting, dust with rice flour and feed the dough through rollers without folding. 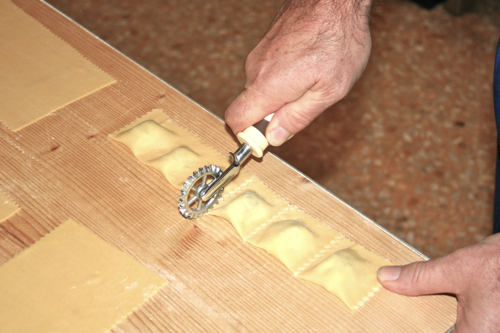 See details on how to do with the machine settings in the pasta dough article. Turn the dial one last time, reducing the space between the rollers until the second to the last of the narrowest settings. Roll one last time. Cover the sheets with a cotton tea-towel to prevent drying. Arrange a sheet of pasta on a large wooden board. Place teaspoons of the filling about 5 cm (2 inches) apart on the sheet so that you can make a “parcel” by folding it over. Using a pasta cutter seal each parcel by cutting on three sides (the fourth is the fold). Dust a large tray or your worktop with flour and carefully place the ravioli on it taking care that they do not overlap. Cook in salted, boiling water until al dente, 1 min. Taste them and cook max. one additional minute if necessary. GF pasta dough overcooks easily so you must be careful. 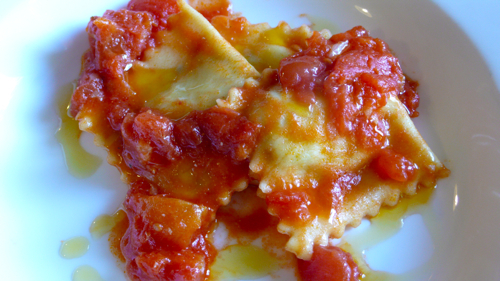 Drain and toss ravioli with butter and lemon or a tomato sauce. Distribute onto 2 plates, top with grated Parmesan (or pecorino) if desired and drizzle with a fruity extra virgin olive oil. I just made a copy. I love gluten free. Will make on Monday and let you know…sounds delicious. Thanks Much. Hi to Google from Mojo, WooF! thanks Kathleen.Let me know how it works! Gluten free flour can be tricky but that one I bought (Cereal brand) worked perfectly, only only needs to adjust the speed as explained above. Can one use the gluten free pre-packaged lasagnia sheets, boil them, cut them, paint the edges with egg white so that the filling does not fall out, fill them and then do you have to boil them filled again? Could you cut dough with a pinking scissors? Also please look up my recipes for lasagna and cannelloni for which you can use the dry pasta sheets provided that you briefly blanch them in boiling salted water. just to let you know as a gluten intolerant person, you can use GF dry lasagne sheets to make ravioli but it’s very very tricky! You can’t cook mor than two sheets at a time in a very large pan or they stick together and you cannot seperate them at all! It is possible with a lot of patience and fiddling around. You can make about two giant ravioli per two sheets of lasagne. I think it’s probably a bit thick and needs to cook a long time to make it flexible and soft enough to work with, but then if you press hard with a fork round the edges, it does stick to itself quite well. thank you for your comment. My felling is that it is better to invest in a pasta machine and practice pasta making rather than fight with pre-made lasagna sheets. In the end you will probably need the same time but if you make the dough you have a fresher product. Thank you I am a new glutein free cook with a 17 ylo daughter who loves ravioli. But she is now glutein intolerate. So thank you for this recipe. On the hunt for a good flour presently. Any ideas, also I remember my grandmother making the pasta, laying the sheets on the bed and making large quanities. Once I get a small amt- recipe fiqure out. How or do you recomend storing Glutein free pasta. I think we are going to get all the girls together once again and try this. (been 10 years so thanks for your tips). Bless you!! Dear Mary Beth, thank you so much for your comment. I don’t know where you live, so I am not able to advice a type of gluten free flour. I personally prefer organic products as they are not added with al sort of strange chemicals. You cannot really make large amounts of gluten free pasta as it is quite fragile. 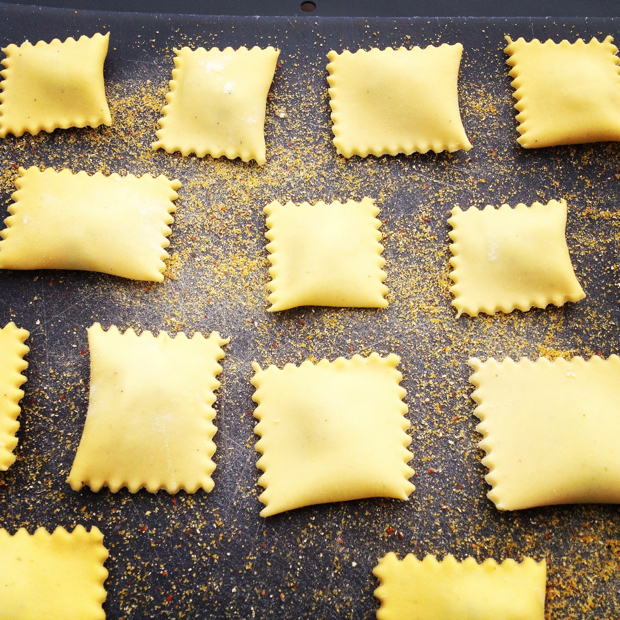 Do try first to make some ravioli with normal flour, to make sure that you are confident with the technique, then make the gluten free ravioli. If the pasta dough is not strong enough to be rolled add more egg yolk which will make it more pliable. Good luck! Hi Letizia, I now am gluten intolerant and have avoided it in recent months. When I was in Italy last year,I asked the tour guide about celiac and gluten intolerance and he said less than 1% of the population has the problem. The wheat in the US is different than Italy; stripped of all nutrients and having GmOs! Do you agree? Hi Michele, about 1 % still makes over 6 million people! and there’s many that go undiagnosed because they don’t know that theri digestive problems derive from wehat. It has taken me years to discover it. I think that this epidemic is strictly related to the bad quality of wheat and the lack of biodiversity. Sadly about 50% of the wheat used in Italy is imported from various countries so we are not so safe! can these ravioli be frozen? Hi Irene, gf pasta can be very delicate and the outcome depends on your flour. Please try first with 3-4 of them, cook the when still forzen and see if they can stand the treatment. Great recipe! I made it for dinner tonight, and it was so delicious! I don’t have a pasta machine, so I just rolled out the dough by hand, and it worked beautifully. I got 13 ravioli out of the recipe which was more than two of us could eat in one meal. Also, I didn’t have xanthan gum on hand, so I just left that out, and the dough was fine. It rolled out really easily. I’ve made GF ravioli in the past, but the dough was too thick and hard to roll out — this dough was perfect, and I could get it thin enough. Thank you for a great recipe! thank you Laura, I am very happy it worked out, ravioli is my favorite pasta and I miss them when I discovered I could not eat wheat!